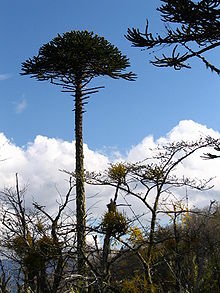 The monkey puzzle tree is native to South America and grows in southern Chile and western Argentina. Because of its great age it is sometimes described as a living fossil. Monkey puzzle is its common name, it is also known as Chilean pine, and its botanic name is Araucaria araucana. It is the national tree of Chile. Its conservation status is classed as ‘Endangered’ as it is declining in its natural habitats. The long straight trunk made it popular for wood, although it is rarely used for wood now. The seeds are edible, similar to pine nuts. It became a popular specimen tree in Britain in the late 1800s – you can read about it’s discovery and introduction on my post here. It became popular for its unusual thick ‘reptilian’ branches. It will grow in temperate climates and likes abundant rainfall. It is hardy to about minus 20 degrees C.
It grows well in western Europe, the west coast of North America, some of the east coast, and in New Zealand and southeastern Australia. As it grows older it tends to lose its lower branches, creating the distinctive umbrella shaped tree, but some trees retain their lower branches. During the 1800s the monkey puzzle tree became a fashionable tree and you will often find specimens growing in the grounds of wealthy family homes, which I find really interesting. You also see monkey puzzle trees planted in much more modest homes in suburban estates, often having grown bigger than the house – equally interesting. The monkey puzzle is one of three living genera in the family Araucariaceae – a division of the conifers. The three genera are Araucaria, Agathis and Wollemia. Within those three groupings are 41 living species which are all native to the southern hemisphere. The greatest diversity is in New Caledonia and others are found in Australia, Argentina, New Zealand, Chile and Brazil. Their common ancestry dates to a time when Australia, Antarctica and South America were linked by land – in the ancient land mass of Gondwana. I find that history to be particularly fascinating… these ancient trees are truly remarkable in that they have survived. Within the same family of Araucariaceae there are another five genera we know about that are all extinct. And in fact the Wollemi pine, the only species in Wollemia, was only known from fossil records and believed to be extinct when it was discovered in 1994. These ancient trees date from 200 million years ago and were probably around when dinosaurs walked on the earth.